Graham Nash continues to add new dates to his solo tour of July and August. 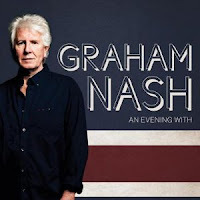 An Evening With Graham Nash already had already been booked into 25 venues and, on Wednesday, five more were added including an August 16 date Levon Helm Studios, also known as The Barn, in Woodstock, NY. Other new dates are in Jim Thorpe, PA, Geneva, NY, Red Bank, NJ and City Winery in New York. Shane Fontayne (guitar, vocals) will be accompanying Nash on the road. "I'm really looking forward to an evening of music, stretching back 50 years, and coming round to today with all it's blessings and problems," says Nash, "a splendid time is guaranteed for all." Graham Nash will continue his long-time tradition of raising money for charity through the Guacamole Fund's special benefit seats; in addition, he will be donating $1 per ticket sold to charity. According to Wednesday's press release, even more dates are expected.